Over the years since its formation, TBSC’s Needles Solutions Team (“NST”) has received many questions from the public about how the County of Santa Cruz’s Syringe Services Program (“SSP”) counts its needles for exchange. 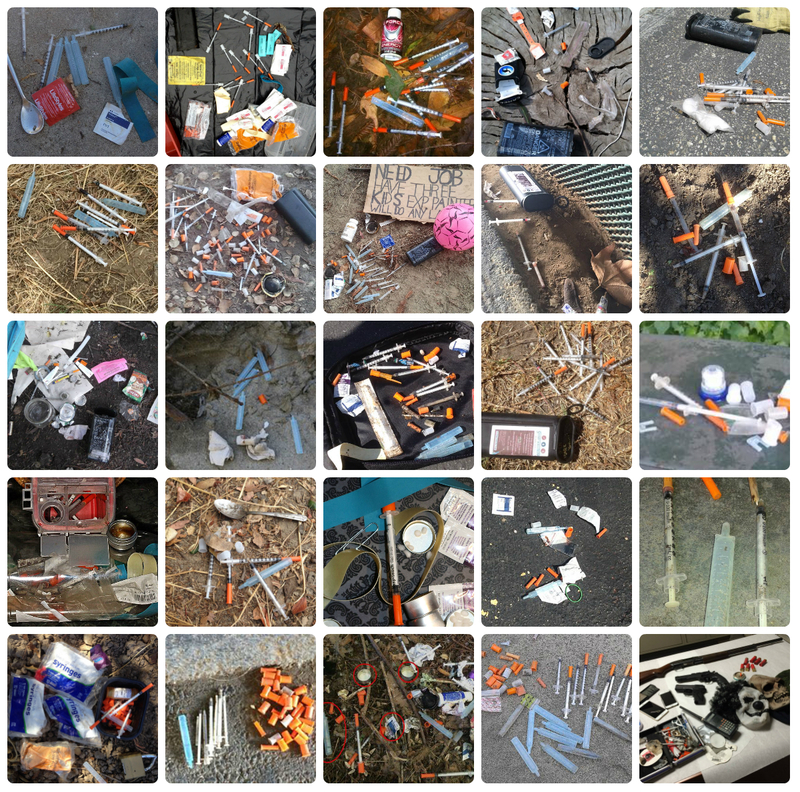 This is an important question because an essential component to any needle exchange program is the actual “exchange” part – that is, keeping dirty needles not only from being reused, but also from being discarded in public spaces. Indeed, the SSP lists both prevention of disease transmission and reduction of needles in public spaces as its goals. Are Needles Weighed or Visually Counted? In early 2014, a member of the NST interviewed a recovering drug addict who said that when she used the county SSP, her sharps container was weighed rather than opened for counting. She claimed in the interview that she would add rocks and other items to add bulk to the container. Her account that needle containers are not actually opened for counting was bolstered by then-County Health Officer Lisa Hernandez’s testimony at a Board of Supervisors meeting on April 15, 2014. During the open meeting, Dr. Hernandez stated that Cal Osha regulations prevented employees from actually opening containers. In May 2014, the NST reached out to the County Health Services Agency (“HSA”), which runs the SSP, to confirm the addict’s account, and get more information regarding how needles are counted. Laurie Lang, the County’s Health Services Agency Public Information Officer responded via email that SSP workers do indeed open the sharps containers for counting. Given the conflicting accounts on how needles are counted, the NST asked if it could have members observe an “exchange” and witness how needles are in fact counted. Ms. Lang declined, citing HIPAA privacy laws. Instead, Ms. Lang offered to arrange a meeting in which NST members would witness a demonstration on how needles are counted. The NST gladly accepted the invitation and arranged a meeting for one month later, on July 31, 2014. Prior to the meeting, Ms. Lang asked the NST to submit questions in advance. The NST therefore posted on TBSC’s facebook page asking for questions from the public – to whom the HSA is accountable. The NST forwarded the public’s question to the HSA in advance, as requested. NST members adjusted their schedules, including arranging for time off of work and finding childcare. However, less than 24 hours prior to the meeting, the HSA cancelled the meeting, claiming that the questions from the public were “too political” in nature. The NST later learned (through a Public Records Request) that on July 18, 2014, Santa Cruz City Councilmember Micah Posner sent an email to Health Services Agency Director Giang Nguyen (yearly salary $220,288.80) expressing concerns about the way needles are counted for purposes of exchange. With much emailing back and forth between them, it took THREE highly paid HSA administrators TEN days to provide what should have been a simple response to Councilmember Posner’s questions about how needles are counted. Instead of responding herself, Director Nguyen asked Health Officer Hernandez to respond. Health Officer Hernandez then asked Health Services Manager Dena Loijos (yearly salary $108,071.24) to “review and edit” her answers. Dr. Hernandez’s initial response was that “Syringe counts are estimated based on counts determined by weights and container size.” Dr. Hernandez’s initial response was consistent with the NST’s understanding that needle counts were determined by weight. However, Dr.. Hernandez’s answer was eventually edited to, “Syringes that are collected by SSP during an exchange are visually examined and the quantity is estimated by SSP staff. No weights are taken at the time that the exchange is performed.” What led to this edit and why the contradiction of statements? obfuscation: Some people are experts at obfuscating the truth by being evasive, unclear, or obscure in the telling of the facts.The usual implied meaning is that this obfuscation is done deliberately.